Consumers have preferences whose determination is outside the realm of economic rules and values. To be successful in current market conditions, product and service companies need to capture such preferences to provide best-fit support by their Information Systems (IS), sometimes by developing entirely new features. 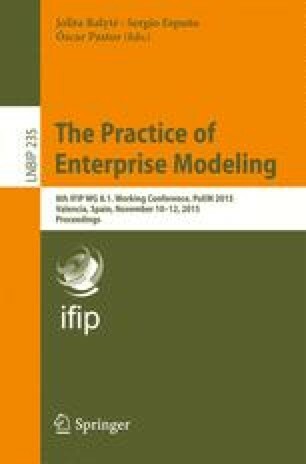 In our previous work, we have conceptualized a meta-model for incorporating consumer preferences into the development of IS —Consumer Preference Meta-Model (CPMM). This artifact was developed with the ability to be expanded with new kinds of consumer preferences, as well as their related concepts. Building upon that work, in this study we consider methodological usage of CPMM for the case of Asker’s Brand Personality as the primary value framework. The framework brings both the enterprise and the consumer into dialog, with this values co-creation fostering synchronicity between the information systems that are designed as an outgrowth of this process, and the desires of both the consumers and the businesses that they will support. The case example uses the Twitter feed of a major airline, whose tweets are processed using Aaker’s 5-factors and Kano’s quality framework. The results complete an instantiation of CPMM that generates a feature model reflective of both brand personality and values co-creation.